Missing teeth can affect the appearance, function, and comfort of your smile. Whether you have lost a single tooth or all of your teeth, dental implants offer an opportunity to fully restore your smile and oral health. A dental implant is a small titanium post which can support a range of tooth replacement options, including crowns, bridges, and dentures. Our team at Dental Health & Wellness of Long Island offers every stage of dental implant treatment in our Northport, NY, office. Dr. Steven Lamberg can examine your smile and determine if this treatment is right for you. Dental implants replace lost tooth roots and provide the ultimate support for crowns, bridges, and dentures. Dental implants are an innovative tooth replacement method which replaces the entire structure of a missing tooth from root to crown. The biocompatible titanium posts act as artificial tooth roots by fusing with the surrounding jawbone tissue. 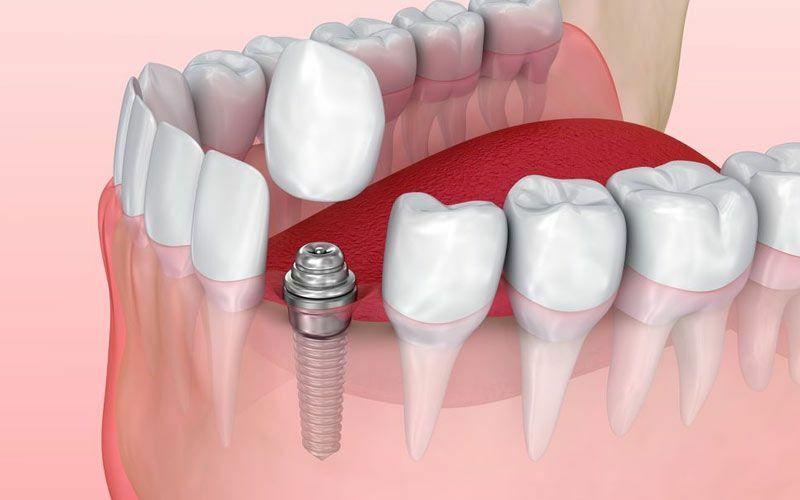 Implants become a part of your anatomy and offer a secure base for a crown, bridge, or denture. In addition, since implants act as artificial tooth roots, they protect your jawbone against atrophy. When teeth are lost, the roots no longer stimulate the jawbone to indicate to the brain that resources are needed in the area. Over time, the jawbone begins to lose tissue and shrink, affecting the stability of surrounding teeth and causing facial collapse. Implants can halt tissue deterioration and protect your overall oral health. If you are interested in replacing missing teeth with dental implants, the first step is scheduling a consultation with Dr. Lamberg. During the appointment, Dr. Lamberg can perform a comprehensive evaluation of your oral health to determine if you are a good candidate. We may also take x-rays of your jaw to ensure you have sufficient tissue in your jaw to support the implants. We offer virtually every aspect of dental implant treatment at our office, so you can receive the care you need in one convenient location. Some patients require preparatory procedures, such as bone grafts or treatment for gum disease. We offer virtually every aspect of dental implant treatment at our office, so you can receive the care you need in one convenient location. If you decide to proceed with dental implants, Dr. Lamberg can design a personalized treatment plan based on a detailed risk assessment and extensive evaluations of your unique smile. Restoring your smile with dental implants involves two stages. You will first need to undergo implant placement. Our implant specialist will embed the implant posts into your jawbone to create a base for your restoration. It typically takes about three to six months for the implants to fully fuse with the surrounding tissue. Once your implants have completely healed, Dr. Lamberg can design a custom restoration to attach to the posts. We offer a range of advanced materials and will work hard to ensure your implant-supported restoration looks natural and fits properly into your smile. At Dental Health & Wellness of Long Island, we are dedicated to supporting the overall health of our patients in addition to improving their smiles. Dental implants offer unparalleled results for patients missing one or more teeth and can restore both the health and appearance of your smile. For more information about dental implants, contact our office online or call (631) 261-6014 to speak to a member of our team today.